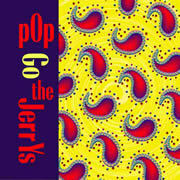 Here’s “Space Cadet” from The Jerrys’ first album, Pop Go The Jerrys, performed at a Chicago rehearsal studio. “My Love in Her Attire,” from The Jerrys’ debut album, Pop Go The Jerrys, is based on a poem I came across while reading The Top 500 Poems. “My Love in Her Attire” was penned by an anonymous poet sometime between 1400 and 1600, and while it is an awesome poem as is, it needed a little work before it could be a Jerrys tune. Below is the original poem as it appears in the anthology, followed by the words to the song by The Jerrys. It does so become her, this is true. For every season she has dressings fit. For winter, spring, and summer too. When all her clothes are gone. It does so become her, what a view! In every color she has dressings fit. In red and green and purple too.